Inverness Caledonian Thistle prevailed against Hamilton Academical in a seven-goal thriller at New Douglas Park. Greg Tansey and Liam Polworth both netted doubles for the visitors, the former with two brilliant free-kicks. Accies had twice drawn level, with Carlton Morris, Ziggy Gordon and, in stoppage time, Christian Nade scoring. But Polworth's late, late winner finally settled a gripping, sensational encounter and powered Caley Thistle into the Scottish Premiership top six. It was as incredible a climax to a football match as you will ever see, with four goals in the last six minutes leaving Accies without a win, or a point, since November. The game's first was a wind-assisted free kick from Tansey which seemed to rocket between the raised arms of the Hamilton goalkeeper, Michael McGovern. The second, early in the second half was from Polworth, a clever effort and his third in three games. It looked enough to take Inverness smiling to the salvation of the dressing room at full-time. But astonishingly Accies responded with a goal from Morris and a dramatic equaliser from Gordon six minutes from time. But hold on, there's more. Tansey scored a wonderful free kick with two minutes to go, before Nade made it 3-3. But even that wasn't that. Polworth grabbed a winner with the last strike of the ball. Inverness striker Miles Storey should have scored after just nine minutes. One-on-one with McGovern the wise thing would have been to round him, although there would have been a smile of approval for his goalie from watching Northern Ireland manager Michael O'Neill. But the fates were not always with him. 10 minutes later the Euro 2016-bound keeper was culpable a basic error after Darian McKinnon dived in and gave away a needless foul. Tansey rattled the free-kick home from 25 yards and this time McGovern didn't look so clever. Caley Thistle were suddenly bossing the game. Polworth scored the second five minutes after the break; an inventive finish with his right foot from just outside the box. It looked brief salvation - or the hint of it - when substitute Morris scored a clever volley from the left side of the six-yard box. But it was, for the home fans, a glimpse of hope through the gloom and in truth Inverness did begin to look nervous. This was no weather in which to play football. The heavens sent a deluge which dovetailed with the gale and only the much-criticised plastic pitch allowed the continuation of play. It was perilous out there. It was curiously engaging but the ferocious conditions surely granted the players forgiveness for misplaced passes and serious misjudgements in the flight of the football. But we could never have envisaged what was to happen next. With six minutes to go, and Inverness seemingly weakening Gordon equalised with a header before Tansey put Inverness ahead again with a superb free-kick. If that was electric, it then went nuclear. Substitute Nade equalised, triggering a a remarkable argument in which three Caley Thistle players blamed one another. But incredibly the Highlanders grabbed victory right at the death, with a glorious strike from Polworth. Match ends, Hamilton Academical 3, Inverness CT 4. Second Half ends, Hamilton Academical 3, Inverness CT 4. Goal! Hamilton Academical 3, Inverness CT 4. Liam Polworth (Inverness CT) right footed shot from outside the box to the top left corner. Assisted by Ross Draper. Goal! Hamilton Academical 3, Inverness CT 3. Christian Nade (Hamilton Academical) header from the right side of the six yard box to the bottom right corner following a corner. Goal! Hamilton Academical 2, Inverness CT 3. 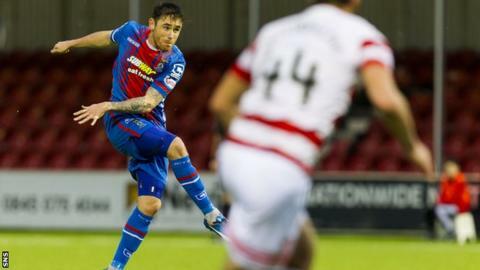 Greg Tansey (Inverness CT) from a free kick with a right footed shot to the top left corner. Substitution, Inverness CT. Danny Williams replaces Nathaniel Wedderburn. Greg Tansey (Inverness CT) is shown the yellow card for a bad foul. Goal! Hamilton Academical 2, Inverness CT 2. Ziggy Gordon (Hamilton Academical) header from the centre of the box to the top left corner. Assisted by Ali Crawford. Attempt missed. Carlton Morris (Hamilton Academical) left footed shot from the left side of the box is close, but misses to the left. Attempt blocked. Jesus Garcia Tena (Hamilton Academical) right footed shot from the centre of the box is blocked. Corner, Hamilton Academical. Conceded by Carl Tremarco. Attempt missed. Carlton Morris (Hamilton Academical) header from the centre of the box is close, but misses to the left. Substitution, Hamilton Academical. Christian Nade replaces Eamonn Brophy. Ali Crawford (Hamilton Academical) wins a free kick on the right wing. Corner, Inverness CT. Conceded by Antons Kurakins. Attempt saved. Miles Storey (Inverness CT) header from very close range is saved in the top centre of the goal. Goal! Hamilton Academical 1, Inverness CT 2. Carlton Morris (Hamilton Academical) left footed shot from the centre of the box to the top left corner. Assisted by Antons Kurakins. Corner, Hamilton Academical. Conceded by Owain Fon Williams. Attempt saved. Ali Crawford (Hamilton Academical) right footed shot from the centre of the box is saved in the top centre of the goal. Substitution, Hamilton Academical. Carlton Morris replaces Louis Longridge.